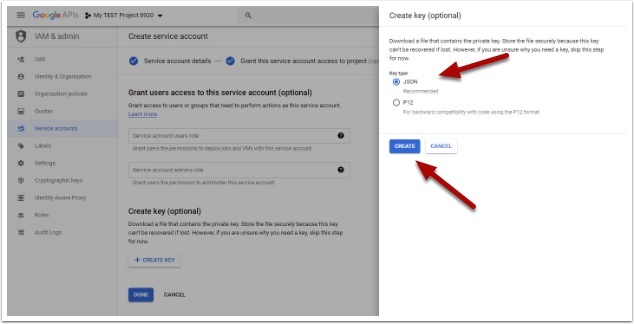 This document describes how to create a Google Service Account Key so that Echo users can easily access Google Suites (Google docs) as they participate in a course. You will need to have an Echo Admin account to complete this task. Along with Super Admin rights to Google Application. Easy creation of Google Drive documents in the Student app when completing a dropbox activity. Previously, if students wanted to submit an activity as a Google Doc, they had to create the document in their Google Drive, then open the activity in Echo and search for that document to attach. Now they can create and submit all within Echo. PDF snapshots of Google Drive submissions. When a student submits an activity as a Google Doc, Echo creates a PDF snapshot that is available to both the student and the teacher. This way a record remains if the student makes changes to the document, or even if the Google Drive account is deactivated. Automatic permissions management. Google Docs makes collaboration and inline commenting easy, as long as all members have the correct permissions. With G Suite integration, Echo automatically gives students (including students that are in the same group assignment) and teachers the correct permissions for easy collaboration. If, for any reason, permissions are not correctly granted, users will simply ask for permission using Google Drive. All users must have a current G Suite email attached to their profile (only the admin can edit these emails in Echo). You must have a Google account to accept Google's terms of service for accessing Google Drive from within Echo. 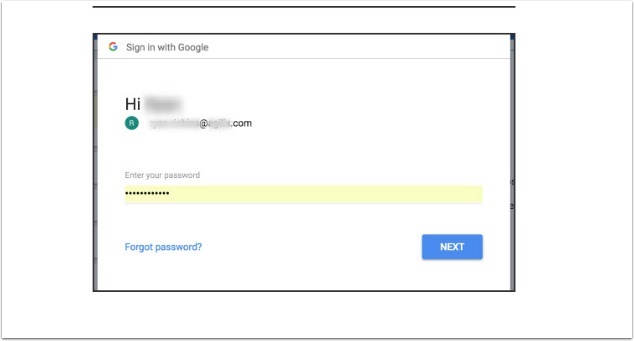 As part of the standard Google security and authentication process, Google provides this account's e-mail address to each end-user before they attempt to access Google Drive in Echo. You can use any account that has Super Admin rights in Google. Our suggested best practice would be to create an account that is only used for authenticating access to Echo. You will need this email address and the password for the next step. If you use your own account for this project, you run the risk of breaking the integration if your leave and your account is disabled. Google has a console that allows you to configure any application, such as Echo, to access Google services through their Application Programming Interfaces (APIs). Echo contains code that accesses Google Drive services, but you must enable that code to run in your Echo domain by agreeing to Google's terms of service and setting up a link between Echo and Google by creating a Google API Project. You will be presented with the following API dashboard. Please note this is an example as your dashboard may appear differently. 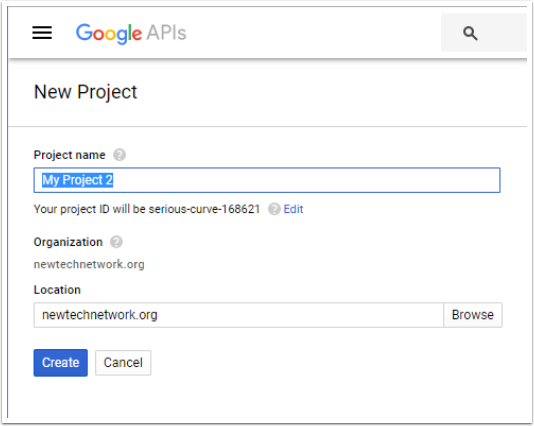 In order for Echo to interface with the Google Drive API, you need to enable it. Open the Menu in the top-left corner of the console and click IAM & Admin >Service accounts. 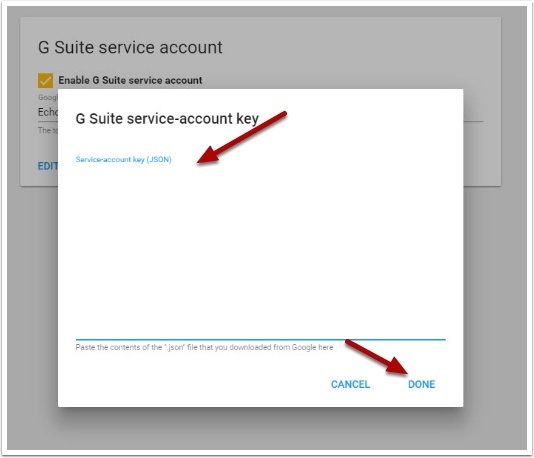 Describe what the service does in the Service account description field (e.g., Integrates Echo with G Suite). Check the Enable Domain-wide Delegation box and enter a name in the Product name for the consent screen field. You can click the View Client ID link to review the service account you have just crated. Copy the Client ID value. You will nee this in Step 4. Once Google Drive API is enable, you need to give Echo access to the service account. 2. In Security, select Show more > Advanced settings, and then click Manage API client access next to Authentication. In the Client Name field, enter the service account's Client ID. You should have copied this in the above step, or you can find it in the Service accounts page. 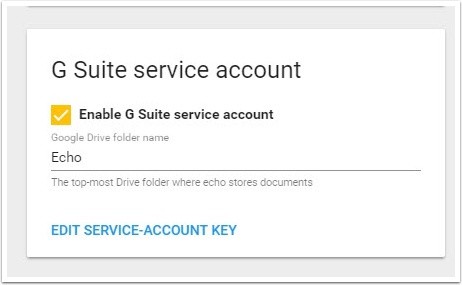 Scroll to Enable G Suite service account box. When users open Google Drive from Echo for the first time, they may be asked to verify the access, sign into their account, indicate which account, etc. Review the possible requests pictured here. If the Google Drive fails to create or copy documents, Echo reports an error. 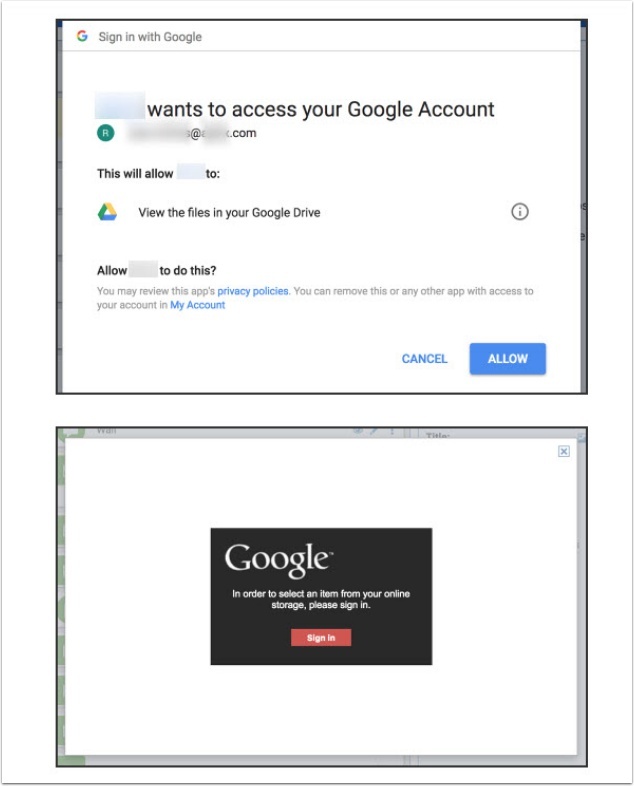 If the Google Drive cannot correctly grant permissions, Echo does not report an error and users will simply ask for permission from the document author using Google Drive screens. If Google fails to generate a PDF snapshot, Echo attaches a TXT file to the activity in the PDF's place, alerting you of the issue.